Templeton Press (West Conshohocken, Pennsylvania, 2016). The Catholic Church has more than its fair share of critics and detractors. The church, as a human institution, has been flawed and certainly found itself on the wrong side of history at times. But there also are accusations based on faulty information, misinterpretations, exaggerations and distortions of fact. “Bearing False Witness” is an effort to debunk some of these accusations, especially those made by renowned thinkers who have shaped Western thought. The book calls some critics anti-Catholic bigots. Especially criticized in highly polemical tones are 18th-century British historian Edward Gibbon and French Enlightenment figures such as Voltaire. 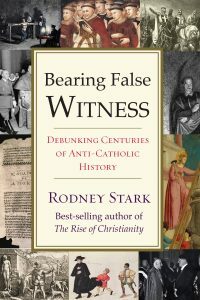 Author Rodney Stark, a non-Catholic, says he wrote the book to set the historical record straight rather than as a defense of the Catholic Church. Stark was born into a Methodist family and is a social science professor at Baylor University, a Southern Baptist school. He is also co-director of Baylor’s Institute for Studies of Religion. People unfamiliar with the historical evidence refuting the many false accusations will find this a good starting point, but have to pluck out the facts from the book’s rhetorical attacks on Enlightenment scholarship. The book notes that the church and its members have not always lived up to Catholic values and principles but adds that this doesn’t mean the church is guilty of every historical “sin” heaped on it. The book doesn’t tackle strictly dogmatic issues such as the divinity of Jesus. It is limited to how the institutional church acted in specific historical circumstances. Readers versed in Catholic history will find nothing new in this book. As Stark acknowledges — and as is attested by the 14-page bibliography and reading list — numerous qualified scholars already have set the record straight regarding false accusations or exaggerations. The book is somewhat uneven in its treatment of issues, though. On some topics — such as anti-Semitism and the Crusades — Stark paints with a broad brush. While pointing out mistaken views and inaccuracies launched at Catholicism, he misses many of the nuances and the gray areas over history that have shaped church attitudes. Regarding the Crusades, for example, he downplays the critique that it was an example of Western Christian colonialism because, he argues, the Crusaders brought more wealth to the Holy Land than they returned to their home countries. Yet, he also downplays the fact that it was an invasion of Muslim-ruled lands by Christians — causing rancor to this day — as four separate Crusader kingdoms were established in previously Muslim-ruled areas. Stark, however, does set the record straight by reminding us that invasions were mutual. The Crusades took place after several centuries of Muslim rule in what was once Christian-ruled parts of Europe. The chapter on anti-Semitism mentions that “Nostra Aetate,” the Second Vatican Council document that included a section on relations with Judaism and the Jews, said nothing new regarding God’s continuous love for the Jews and that they cannot be blamed for Christ’s death. But it neglects to mention that well into the 20th century, these concepts, using terms such as “perfidious Jews,” were an ingrained part of Catholic Holy Week liturgies. They weren’t removed until the pontificate of St. John XXIII, who also convened Vatican II. Other chapters catch the nuances, especially those on slavery and on the church’s attitude toward worldly power and governments. On slavery, the book shows how the church officially was opposed to it, yet had to temper its opposition when it came to the colonization in the New World by Catholic Spain and Portugal. Regarding worldly power, the book notes that during the Middle Ages two parallel churches arose, often at odds with each other over time. The “church of piety” has been historically concerned with prayer, evangelization, missionary work and education; while the “church of power,” basically the hierarchy, has been concerned with protecting the church’s worldly power and prestige.